Can I use my Medisave for the procedure? Medisave claims can only be used for procedures listed in the “Table of Surgical Procedures” maintained by the CPF Board. The only 3 procedures that you can claim from your Medisave is for Cyst Removal, Apical Surgery & Implant Placement. Our clinic is a CPF accrediated clinic so we can help you with your claims if the need arises. Root canal treatment (RCT) is needed when you have a tooth decay resulting in a toothache, a condition known as acute pulpitis. This can be excruciating and will keep you awake the whole night. This arises when the pulpal tissue/nerves are inflamed due to a variety of factors like tooth decay (60%), large and deep fillings or insults to the tooth (35%) or trauma (5%). Thus, a root canal treatment is done to relieve the pain caused by the inflammation of the pulp. A root canal treatment can also be done electively, that is to say we anticipate that the pulp is going to be inflamed. This is especially so in teeth with large fillings that we would wish to put on a crown/cap. My dentist referred me to a specialist/endodontist Singapore for RCT. Why has he done that? Specialist in root canal treatment are known as endodontist. They received additional post-graduate training ranging from 1-3 years after their basic dental degree. After their post-graduate training, they have to undergo further training to refine their clinical skills before they are certified by a national board. After certification, they can then be official known as a specialist endodontist. In Singapore, the list of dental specialist is maintained by the Singapore Dental Council. 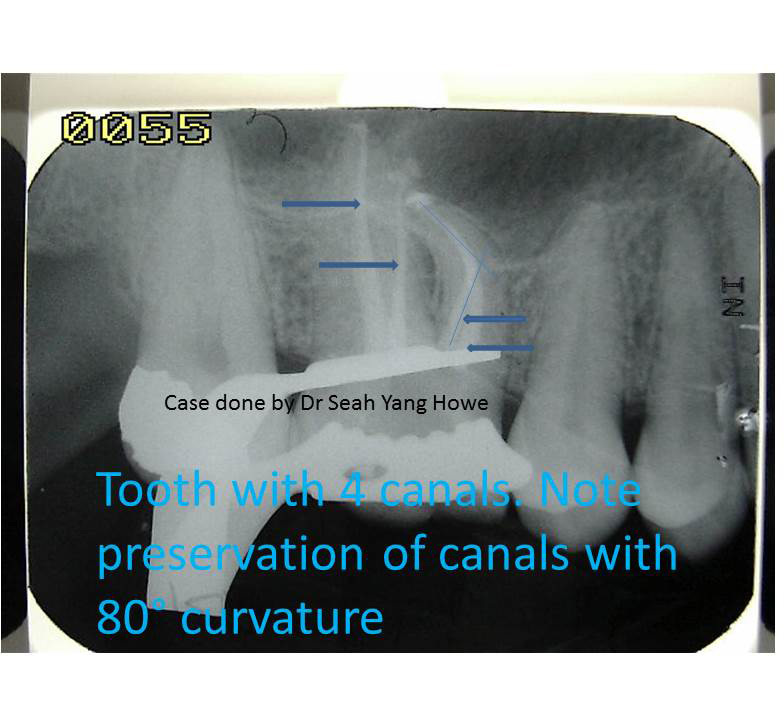 For the current list of endodontist, please go to http://www.sdc.gov.sg/sdc/html/SDCProfSearchframe.html. If the name of a dentist is not on the list, he is legally not a specialist and cannot profess to be an endodontist or a specialist in root canal. Do not be fooled by claims of being a from a foreign university. The Singapore Dental Council maintains a very high standard. Any dentist who does not meet the criteria of a specialist is not registered as a specialist by the Singapore Dental Council, Period. An Endodontist receives more training in root canal treatment and practice root canal treatment daily, they are more proficient in the science and art of root canal treatment. Their highly focused training enables them to provide a high-quality comprehensive care for their patients. Thus, they are able to handle more technically challenging cases and execute the procedure more effectively and with more predictable results. They also charge more for their services, due to their extra training. Your dentist referred you to an endodontist because your tooth is technically more challenging and he feels that your dental care will be in better hands. Is the procedure painful during root canal treatment? Because pain is an individual experience, the amount and type of pain you may feel may not be the same as what others feel, even when undergoing the same procedure. Most of the time, after local anaesthesia is given, no dis-comfort is felt during the procedure. However, there are occasions where a severely inflamed tooth is not so receptive to local anaesthesia and twinges are felt during treatment. Please inform the endodontist when this happens and he will take appropriate measures. Is the procedure painful after RCT? The tooth and the gum around it may feel sore for 2-3 days after root canal treatment. This is normal and there is nothing to be alarm about it. 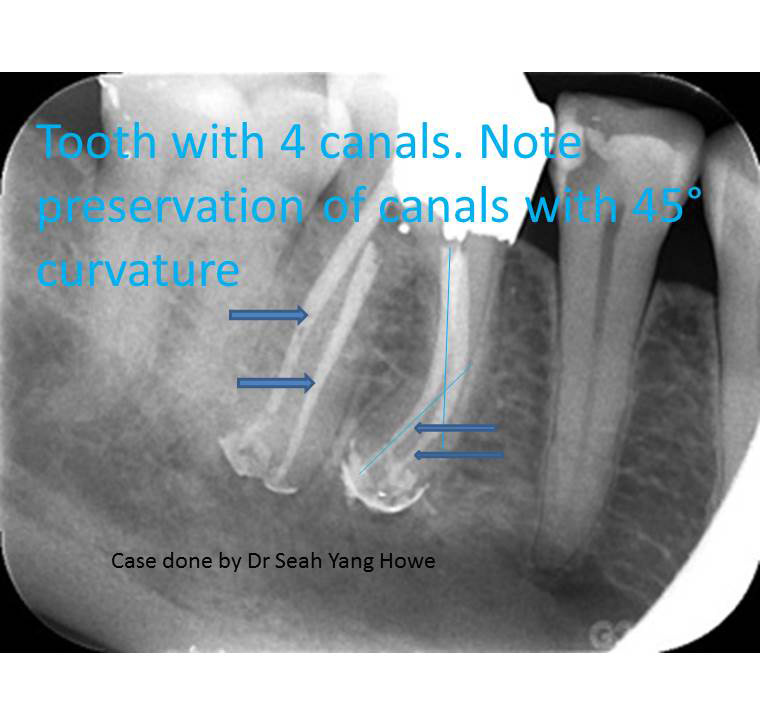 If the dis-comfort persists longer than that, please call up our office to let Dr Seah have a look at the tooth. For your comfort, we aim to reduce your dis-comfort to a level so that you can proceed with your normal everyday activities. Can I just take a strong painkiller for my toothache? If you are experiencing severe dis-comfort that keeps you awake at night, please do not delay treatment. Early diagnosis and treatment gives you the best chances of containing a problem before it becomes more serious and difficult to treat. In severe cases, patients are kept awake at night in spite of taking strong analgesics. In some cases, placement of ice chips or cold water relieves the dis-comfort and patients have been known to forgo their sleep to place ice chips or take sips of cold water continuously throughout the night. The cost of the procedure will depend on the complexity of the treatment. Our clinic prides itself on our charges which are transparent. We have no hidden charges like GST or medical consumables. Will I need a crown after RCT? A root canal treatment is never complete without a crown, except for incisors. This is to prevent the teeth from fracturing as well as to achieve a tight seal to prevent bacterial re-infection. Will I need RCT if my dentist is doing a crown for me? This depends on the condition of the tooth before crowning. If there is a large and deep filling before the crown is placed, your dentist may elect to have the RCT done electively before the crown is placed. If the tooth is healthy enough, RCT is not needed. Will my teeth last forever after RCT and crowning? Unfortunately, nothing will last forever. The root canal treatment will last for as long as the seal of the crown is intact. Each crown has an average life span of 7-10 years. When the crown is being re-done, your dentist/endodontist will assess the amount of leakage present. If there is minimal leakage, the root canal treatment does not have to be re-done. 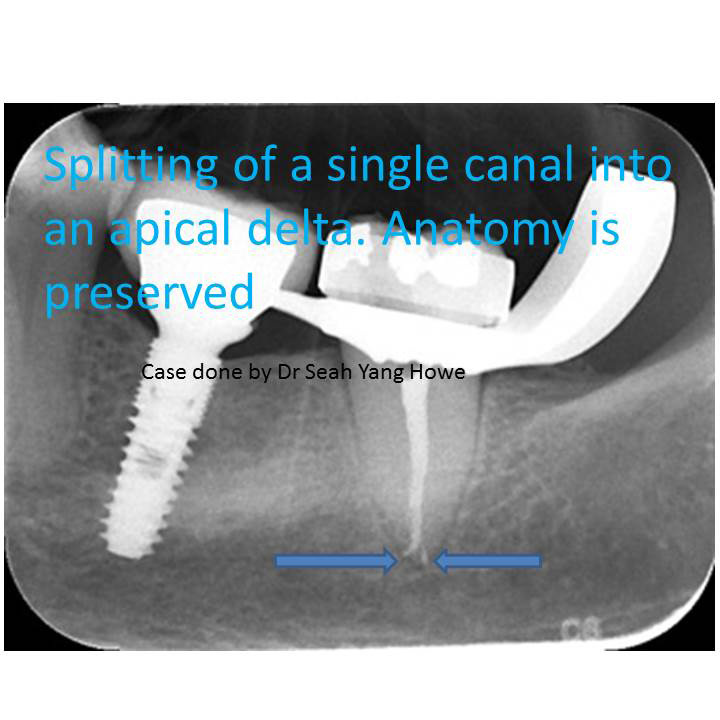 However, if the amount of leakage is severe, the root canal treatment will have to be retreated. Unfortunately, not all teeth can be treated. Teeth that are loose or have too much decay are not suitable. Teeth that cannot be crowned are also not suitable. Please let us examine your teeth so that we can best advise you on the prognosis of your teeth. Even though we are in the root canal business, we keep an open mind and have your interest at heart. 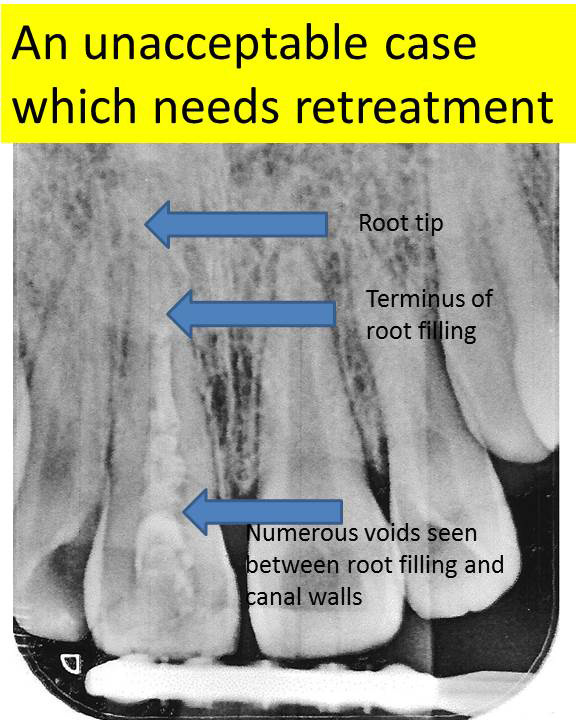 How can I tell whether the quality of the root canal is acceptable? For a root canal filling to be of an acceptable quality, firstly the root canal filling must end at the terminus of the root tip or at least 0.5mm short of it. 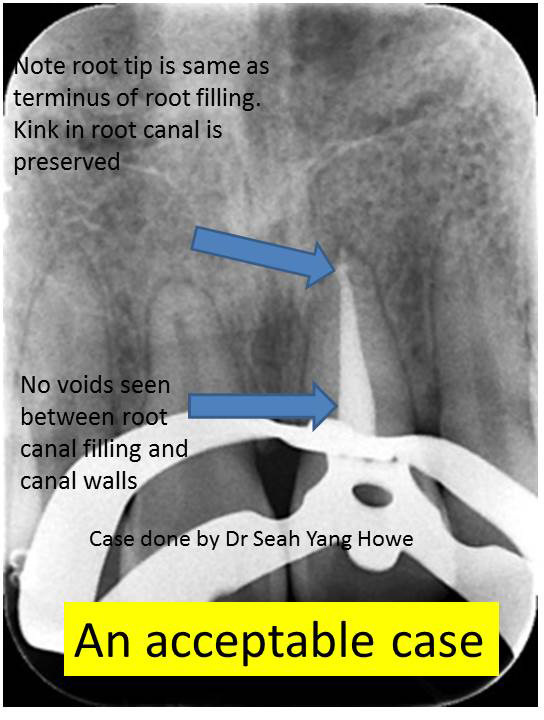 Secondly, the filling must be dense and no voids must be seen between the filling and the walls of the tooth. Thirdly, any curvature of the root must be respected and the filling should follow the curvature of the canals and not ledge or perforate it. Do not be afraid to ask your dentist to show you the end result of his work.